The designer rejects the criticism. A Black fashion design student is facing backlash after posting a picture of a swimsuit she designed. Palais Du Dèsir designer Vanessa Danelle posted a picture of the suit, the first item in a collection she dubbed “Chinoiserie,” on her Instagram page on January 4, according to NextShark. The reversible bikini is made from fabric commonly used by Asian designers to make dresses and adorned with feathers and stones. Danelle announced it would be available on February 5, just in time for Chinese New Year. Instead of generating sales, however, Danelle was accused of fetishizing Asian women. One user, known as taejkang, slid in the designer's DMs to politely ask for the suit’s removal, reports the New York Post. “It was brought to my attention one of your most recent products sparked a bit of controversy. This product, although very beautiful, contributes and promotes the oversexualization and fetishization of Asian women," taejkang wrote. The suggestion was rejected according to now protected screenshots taejkang shared on Twitter. "There is no Asian woman wearing my clothing, so how does it oversexualize Asian women? It’s just fabric, and if Black people can’t use Asian fabrics, [let me know] where that law is written," Danelle responded. "By you asking me to remove MY work from MY page shows how disrespectful YOU are. You have some nerve. No, it won’t be taken down. I’m not here to please you or any of the internet trolls who dislike my work. Check yourself before you check me. Chinoiserie, by definition, is imitation of Chinese motifs in western art." In speaking with Blavity, Danelle said she remains puzzled by the criticism she received. "When the controversy began, I initially had no reaction because I couldn’t (and still can’t) understand where it stemmed from," the designer told us. 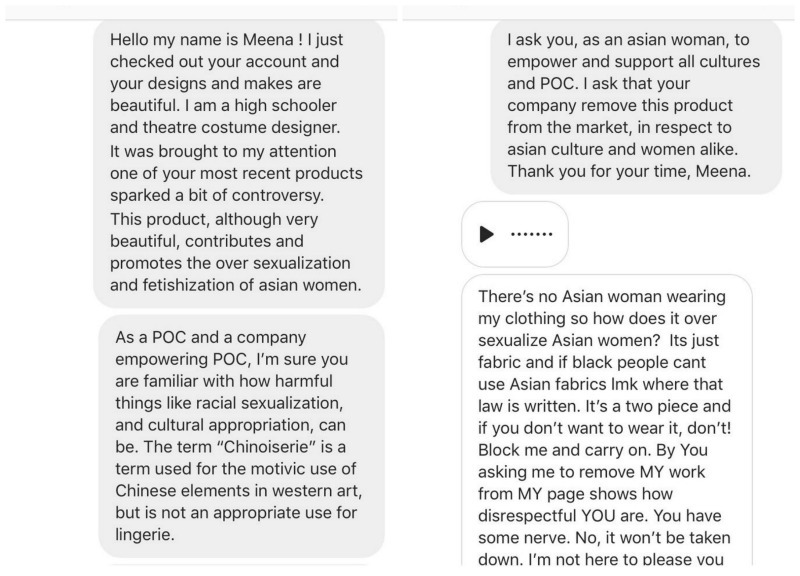 "My initial thoughts were, 'How could I be sexualizing Asian women’s bodies when it's not pictured on a human body at all?'" Danelle said she saw the accusation of oversexualization and appropriation as a "misinterpretation." "What I think incited the backlash is simply the sensitivity of our society [and] a tad bit of ignorance," she added. "The people who have accused me of ‘racism’ and ‘cultural appropriation’ are those who have misinterpreted the words' meanings thanks to social media." The designer also believes many social media users accusing people and brands of cultural appropriation "feel that their race or ethnicity’s culture can only be embraced by themselves." Elaborating on that point, Danelle said, "The line between cultural appreciation and appropriation have become blurred in today’s society for sure. People now believe that customs, inventions, dance styles, etc. of one race used by another is an appropriation and that is not the case." She also told us her controversial swimsuit was inspired by multiple "photos and ideas" from a wide variety of cultural touchstones, including the Caribbean fashions seen during Carnival. Danelle said the Chinese elements were introduced as a way to showcase her skills, and fans and critics alike can expect similar pieces to debut soon. "For added versatility and to highlight craftsmanship, I made the set reversible so the wearer could have the option to show the Chinese brocade if they please. The mini collection is to be a compilation of matching add-ons such as shorts, pants and a kimono cover-up, to make the ensemble wearable for more than just swim or lingerie." Following the social media dust-up, Danelle posted a statement on Instagram soliciting prom orders and asking if “you guys [are] done kicking and screaming about fabric?” In her post, she suggested critics focus on issues like the partial government shutdown. The swimsuit image is still posted, but Danelle has disabled the comments section of that image. She told Blavity she chose to do this because "I didn’t really care what anyone had to say about my work. It’s something I created so I’ll choose to stick by it always." Overall, the designer said, "All of this has been a blessing more than a curse because all I’ve ever wanted was to share my work with those whose minds can embrace it." Danelle said her ultimate goal with fashion is to challenge both herself and the way others view fashion. The subject requested her last name be changed to allow for some anonymity.